We started off yesterday by visiting The Ice Sculpting Festival at the National History Museum (of course we ruined the ‘free’ bit by also going to see the Darwin exhibit, but that was well worth the £17 especially as they gave us free passes to go back as we didn’t finish). 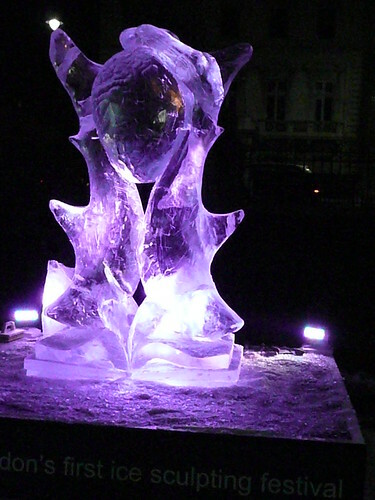 It was absolutely freezing but the Ice Sculpting still drew quite a crowd and it was pretty fascinating seeing the ice blocks being slowly transformed. When we went back in the evening they were backlit by purple lights which made the whole place rather magical. Next free event we plan to take advantage of: Ukulele Wednesdays. We can’t play, but we can singalong! 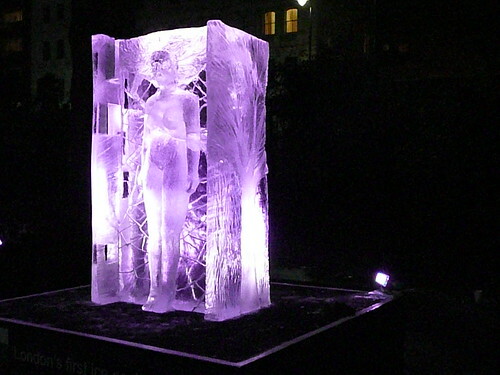 This entry was posted in Uncategorized and tagged free, ice sculpting, London. Bookmark the permalink. The sculptures are amazing, but Ukulele Wednesdays? I may have to reschedule my trip for the middle of the week.